I'm very grateful to my cousin Angela Jefferies for her great help in supplying details of cousinly Blunts once and twice removed, plus earlier generations essential to an understanding of G Blunt & Sons, the remarkable family firm of book binders. It would be unrealistic to try and tabulate the cousins descendent from our Grandpa Blunt's brothers and sisters, so please click here to see a hand-drawn family tree extending from the early 1850's down to the late 1970's. 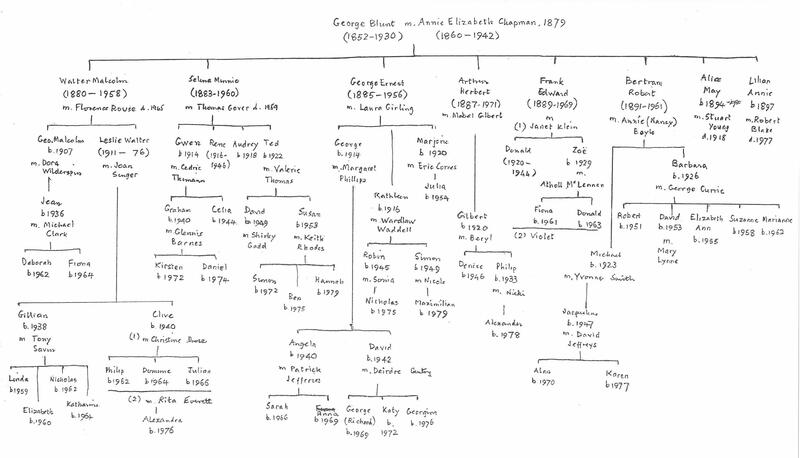 The following Generation Table essentially extracts that part of the hand-drawn tree relating to those of us descended via George Ernest Blunt, with additional details as to names in full and complete BMD biodates (ie "hatches, matches and dispatches"). A subsidiary forename used in preference to the leading forename is italicised. A regularly-used diminutive or nickname used in preference to the given forenames is italicised and parenthesised. eg. My mother Kathleen was always known as such, or as Kath, within her own family, but my father and other then family friends always called her Kate, and my step-father and more recent family and friends always called her Katie. eg The Blunt family always referred to my father as Wardlaw (his second forename), though his own family always used Walter (his first forename, which he detested). During their marriage Katie always called him Bill, or sometimes Wardlaw. eg Katie's second husband was Paul Geoffrey Simson Coupland, known as Geoffrey. Note however that diminutive names such as Annie, Jessie, Minnie etc were often used as given names in Victorian times, just as Harry, Sally etc nowadays often are. Details of two earlier generations (-4 and -5) are publicly available from Angela's excellent Ancestry webpage, with the usual proviso that to view the original you must first be logged-into the Ancestry website. But, in contrast, quite a lot is now known about her daughter-in-law Selina Hounslow. Ever since I first read of an ever-so-great grandmother with such a wonderful name – one instinctively thinks of a reckless young adventuress, open-top Rolls-Royces, sleek salukis, sand-dunes surging to the horizon, diaphanous silk scarves and exotically handsome admirers – maybe my imagination runs away with me sometimes – I have been intrigued by her. So, quite recently (Apr 2017) I looked slightly more deeply into the back-history of the Blunt forebears, including Selena herself, and there's much to be found and some things still elusive. Selena's background wasn't exotic – though still slightly unusual – but she became matriarch of the Blunt dynasty, with a great deal to be proud of. And the first thing to note is that there were in fact two Selina Hounslows, and that they were first cousins. It might seem (with over eight years between consecutive entries) that baptismal business wasn't very brisk in the parish of St Martin in those days, but seen in context it's evident that the older Selina's parents simply hadn't bothered to get her baptised until her infant cousin appeared on the scene. Clearly then a case of inter-parental rivalry, the baker just pipping the brewer to the font. But it does mean we must be careful not to confuse the two families further along the line, though I think it becomes evident that John and Thomas were in fact brothers.